To Cite: Momen S B, Siadat S D, Akbari N, Ranjbar B, Khajeh K. Applying Central Composite Design and Response Surface Methodology to Optimize Growth and Biomass Production of Haemophilus influenzae Type b, Jundishapur J Microbiol. 2016 ; 9(6):e25246. doi: 10.5812/jjm.25246. Background: Haemophilus influenzae type b (Hib) is the leading cause of bacterial meningitis, otitis media, pneumonia, cellulitis, bacteremia, and septic arthritis in infants and young children. The Hib capsule contains the major virulence factor, and is composed of polyribosyl ribitol phosphate (PRP) that can induce immune system response. Vaccines consisting of Hib capsular polysaccharide (PRP) conjugated to a carrier protein are effective in the prevention of the infections. However, due to costly processes in PRP production, these vaccines are too expensive. Objectives: To enhance biomass, in this research we focused on optimizing Hib growth with respect to physical factors such as pH, temperature, and agitation by using a response surface methodology (RSM). Materials and Methods: We employed a central composite design (CCD) and a response surface methodology to determine the optimum cultivation conditions for growth and biomass production of H. influenzae type b. The treatment factors investigated were initial pH, agitation, and temperature, using shaking flasks. After Hib cultivation and determination of dry biomass, analysis of experimental data was performed by the RSM-CCD. Results: The model showed that temperature and pH had an interactive effect on Hib biomass production. The dry biomass produced in shaking flasks was about 5470 mg/L, which was under an initial pH of 8.5, at 250 rpm and 35° C.
Conclusions: We found CCD and RSM very effective in optimizing Hib culture conditions, and Hib biomass production was greatly influenced by pH and incubation temperature. Therefore, optimization of the growth factors to maximize Hib production can lead to 1) an increase in bacterial biomass and PRP productions, 2) lower vaccine prices, 3) vaccination of more susceptible populations, and 4) lower risk of Hib infections. Before discovery of an effective vaccine, Haemophilus influenzae type b (Hib) was the most important cause of bacterial meningitis, otitis media, pneumonia, cellulitis, bacteremia, and septic arthritis in infants and children younger than five years (1, 2). It is a significant public health concern in many parts of the world, with as many as 3 million cases of serious disease occurring every year. The Hib capsule is its major virulence factor, and is composed of a polyribosyl ribitol phosphate (PRP) that can induce protective and effective immunity (3). Hib PRP is a polymer of repeating monomeric units, structurally characterized as β-D-ribose-D-ribitol-phosphate (4, 5). The first generation of vaccines for Hib was licensed in the United States in 1985, based on purified capsular polysaccharide (6). This type of vaccine stimulates a T cell-independent immune response and prevents Hib infections in children older than 2 years, but it does not protect infants (7). Since about 75% of Hib infection cases occur in children younger than 2 years, second-generation Hib vaccines, which induced T-cell dependent immune responses, were produced as PRP-protein conjugates and licensed in the United States in 1987 (8). The price of the conjugated PRP vaccine is high (9), and therefore a major challenge in Hib vaccine production is to develop a cost-efficient vaccine. To enhance biomass and PRP productions, most previous studies have focused on Hib cultivation with respect to essential chemical, biochemical, and physical factors such as pH, DOT (dissolved oxygen tension), aeration, temperature, and agitation (10-12). Most of these studies employed single factors or multiple factors by changing one variable at a time, while keeping the others at a constant level. However, such growth conditions do not mimic the natural bacterial growth condition, which is affected by simultaneous actions and interaction of the growth factors. Therefore, in the present study, we used a central composite design (CCD) and a response surface methodology (RSM) to examine the main and/or interactive effects of a factorial combination of pH, temperature, and agitation treatment factors on the growth of Hib and biomass production. Response surface methodology enabled the identification of optimum levels of growth factors in maximizing Hib biomass, and more PRP production as a direct result (10, 13). Response surface methodology guides the plan of the experiments and the parsimonious analysis of data to gain a maximum amount of information most efficiently (14, 15). A strain of Haemophilus influenzae type b, ATCC 10211, was used in all the experiments. The culture medium was prepared according to the method explained by Maitre-Wilmotte et al. (16), with some modifications. It had 5 mg of β-NAD (Sigma, Germany), 0.015 g of protoporphyrin IX (Sigma, Germany), 20 g of glucose (Merck, Germany), 5 g of dialyzed yeast extract (Sigma, Germany), 70 mg of cysteine (Sigma, Germany), 10 g of bactopepton (Difco, USA), 20 mg of tryptophan (Sigma, Germany), 31.14 g of Na2HPO4 .12H2O (Sigma, Germany), 2.03 g of NaH2PO4.2H2O (Sigma, Germany), 1 g of (NH4)2SO4 (Sigma, Germany), 0.4 g of MgSO4.7H2O (Sigma, Germany), and 0.02 g of CaCl2.2H2O (Sigma, Germany). All material was dissolved in de-ionized water to a final volume of 1 L, and the medium was filtered in a 0.8 µm (Millipore, Canada) membrane. Fifty mL of the culture medium was distributed to a non-baffled 250 mL Erlenmeyer and autoclaved at 121° C for 30 minutes. Protoporphyrin was dissolved in 100 mM NaOH. Glucose, NAD, and protoporphyrin were sterilized separately by filtration with 0.22 µm (Millipore, Canada) membranes, and transferred to experimental flasks. The preparation of the working seed and inoculation of experimental culture flasks were done according to the methods explained by Merritt et al. (11). A deep frozen 1 mL vial of Hib in 15% glycerol was thawed and transferred to two chocolate agar-slant tubes, then incubated at 37° C for 18 hours. The surface grown bacteria were harvested and re-suspended in 2 mL of the culture medium, and transferred to a 500 mL Erlenmeyer with 200 mL fresh culture medium. It was then incubated at 300 rpm in a shaker incubator at 37° C, for 6 - 8 hours. 5 mL of this culture was used to inoculate 45 mL of the culture medium in each of 250 mL experimental flasks. 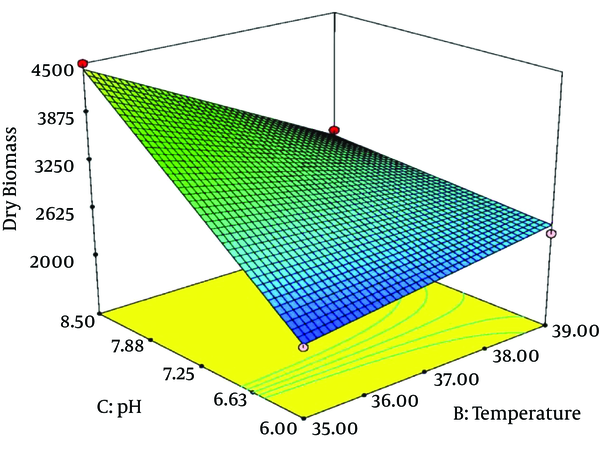 The temperature, agitation, and pH of each experimental flask were adjusted to the designed point. The flasks were grown for 19 hours. The amount of dry cell weight (DCW) was determined by dry-weight measurement. After the cultivation period, each cultured medium was heat-deactivated at 60° C for 30 minutes and centrifuged at 3200 g, at 4° C for 60 minutes in pre-weighed tubes. The supernatant was saved for a PRP assay in the next steps, and the pellets were re-suspended in 0.15M NaCl and centrifuged again. The supernatant was discarded and each tube containing the cell mass was dried at 60° C for 24 h and weighed to get the dry cell weight (17). In this research, the effects of three continuous treatment factors (temperature, agitation and initial pH of culture medium) on the Hib growth were examined to find their optimum, lower, and upper values in maximizing Hib biomass and PRP production. We used a central composite design consisting of a factorial treatment structure, including a total number of treatment combinations N = 2K + 2K + n0. K is the number of treatment factors, n0 is the number of replicates of treatment combinations at the center (n0 > 1), and 2 is the number of axial points of the axis of each treatment factor, at a distance of α (α = 2K/4) from the design center (18, 19). We used three treatment factors: temperature, initial pH of medium, and agitation (k = 3), six replicates of the center point combination (n0 = 6), six star points, and α = 1.682. This resulted in 20 test series, as shown in Table 1. The levels of the treatment factors are shown in Table 2.
aStudy Type: Response Surface; Initial Design: Central Composite; Design Model: Quadratic; Runs: 20. Where Y = the predicted mean of Hib dry biomass. To illustrate the relationships between experimental and predicted values, the response surface plots were shown. Design-Expert software (version 7, Stat-Ease Inc., Minneapolis, USA) was used to set up the design and analyze the data. 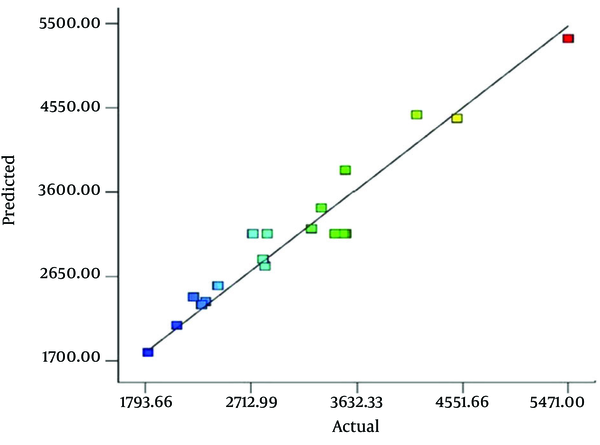 The fitness of the model was evaluated based on 1) non-significant lack of fit test, 2) reasonable and significant R2 values (Table 3), close agreement of measured versus predicted mean biomass (Table 4 and Figure 1). The above polynomial model is expressed as 3-dimentional response surface graphs, indicating the maximum DCW values and the optimum values of the related explanatory variables. The maximum obtained DCW was about 5471 mg/L. The optimum values of the three treatment factors were agitation 250 rpm, temperature 35° C, and initial pH 8.5. Table 4 shows the actual Hib DCW values measured based on the experiments and those values predicted by the RSM model. With reference to ANOVA data (Table 3), the pH of culture medium and temperature of incubation are very effective factors in the growth of Hib (p-value equal or < 0.0001). Takagi et al. (10) obtained about 4300 mg/L DCW of Hib (strain GB 3291) in a fermentor with overlay aeration, and 4900 mg/L DCW with 10% air saturated DOT (dissolved oxygen tension), without pH control, and proposed that Hib biomass production is better at low dissolved oxygen if pH is not controlled. Under our study’s conditions, the experiments were carried out in shaking flasks without air-sparged and uncontrolled pH, and we obtained about 5471 mg/L DCW of Hib biomass, after optimization of treatment factors by RSM. This reasonable yield of Hib biomass is in accordance what Takagi et al. (10) had proposed. 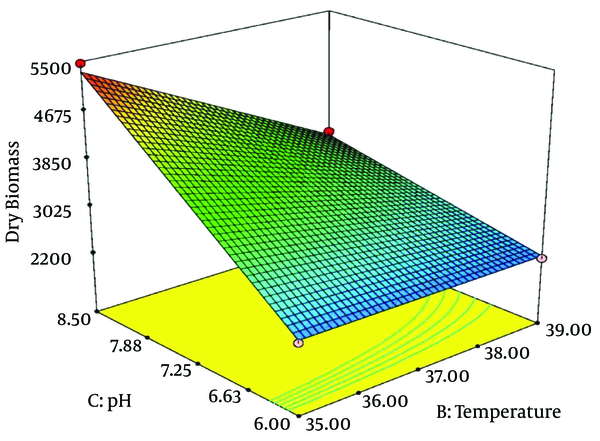 Figure 2 and 3 illustrate the 3-D response surfaces that show the effects of temperature and pH. Hib biomass production increased considerably when initial pH increased from 6 to 8.5 and temperature decreased to 35°C. When initial pH was less than the optimum point and tended towards 6, and agitation had fallen toward minimum values (about 100), Hib biomass production decreased parallel to decreasing temperature, from 39° to 35°C. At higher values of agitation (over 200 rpm), there was no significant difference between the amounts of Hib biomass produced at temperatures from 35°C to 39°C. However, when the initial pH was 8.5, decreasing incubation temperature from 39°C to 35°C led to substantially increased Hib biomass. Despite the extensive studies that have been done on Hib, published studies on Hib cultivation are rare (9, 10), especially on the statistical optimization of physical and chemical factors affecting growth and bulk production of Hib biomass. Over the past years there has been only one published article using a reliable statistical method (Plackett-Burman Design) for optimization of Hib culture medium components (12). Nevertheless, Takagi and her colleagues published several very valuable articles on improvement and characterization of Hib PRP production (9, 10, 13, 17). Also we found that by using statistical methods like RSM and CCD to sketch an optimization plan, there will be a huge savings in the number and type of essential experiments, materials, time, depreciation of equipment and devices, human resources and specialists, and consumed energy, that will finally result in a lower overall price of the vaccine. We found CCD and RSM very effective in optimizing Hib culture conditions. Hib biomass production was greatly influenced by pH and incubation temperature of cultured media. Therefore, optimization of the growth factors to maximize Hib production can lead to 1) increased bacterial biomass and PRP productions, 2) lower vaccine prices, 3) vaccination of more susceptible populations, and 4) lower risk of Hib infections. The authors wish to thank Dr. Bahram Momen at University of Maryland for his valuable suggestions on preparing the statistical part of the manuscript. Thanks are also due to Mr. Amin Arsang at the Pasteur institute of Iran for his collaboration in Hib cell cultivation. Authors’ Contribution: Seyed Bahman Momen performed the research and wrote the manuscript. Seyed Davar Siadat designed the research. Neda Akbari and Bijan Ranjbar performed the experimental designs. Khosro Khajeh supervised the research. Funding/Support: This project was supported by the Ph.D. grant from Tarbiat-Modares University, Tehran, Iran.